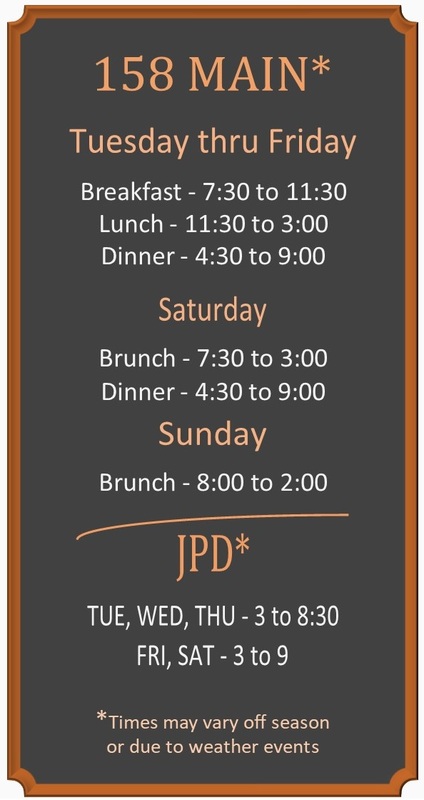 158 MAIN & JPD – EAT WELL ~ DOWNSTAIRS, UPSTAIRS & TO GO! Whether you are coming off the Smugglers Notch slopes, getting away from the city, celebrating a wedding, relaxing from work or preparing for a day’s hike, you can be certain to find a meal to suit your appetite, tastes and mood at 158 Main and Jeffersonville Pizza Department. At 158 Main, we offer a traditional dining experience with a splash of innovation. The inspiration for our menu stems from a fusion of contemporary and traditional concepts. We offer only the freshest, tastiest ingredients from a perfect blend of locally grown, homemade, fresh country cooking and contemporary cuisine. Our kitchen and dining room crew is dedicated to the quality of your meal and dining experience and will make sure that your time at our tables will leave you with memories of outstanding flavor, warm atmosphere and a true Vermont dining experience. Jeffersonville Pizza Department (JPD) is right around the side and up the stairs from 158 Main. We have developed a varied to-go menu that will please every appetite with tasty, generous portions at the most reasonable prices around. JPD is not only for take-out. Our bright and spacious dining room is the perfect setting to savor pizzas, pasta, subs, salads and side dishes and to host your special events. Chef Foley and The 158 Main and JPD Crew thank you for your interest and for dining with us. ~ Eat Well!